Not a day (or even an hour!) goes by without someone asking Lon Welsh or me if we’re in a housing bubble. 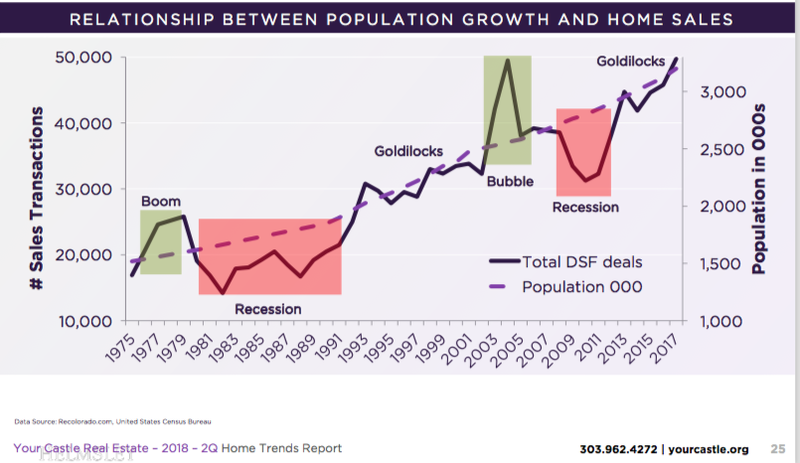 It’s the number one question we get from agents, clients and the media alike and one we’ve been answering for literally 5 years as an endless series of doom and gloom pessimists have falsely called the top of the market… and been wrong every time. The fact is, NO ONE knows when a market correction will occur. Keep in mind, the last upturn in our market lasted 17 years, from 1990 – 2007! Will this one last 17 years? Who knows. All we can do is look objectively at the data and do our best to interpret what we see. So, while no one can ever predict the future with certainty, I see no evidence that we’re heading for a downturn in our real estate market any time soon. Note: At the bottom of this post is a YouTube video recording a link to a podcast that goes into more data than this blog post. Even with the continued increase in metro Denver home prices (up another 10.5 percent in the past 12 months) the average inflation-adjusted PITI (Principle, Interest, Taxes, and Insurance) payment made in metro Denver is only slightly above our 35-year average. This means that while prices have steadily risen, buyers are still able to afford their monthly payments, providing plenty of room for continued home price increases. The simple and obvious evidence for that is the large number of buyers still making offers and closing on properties. 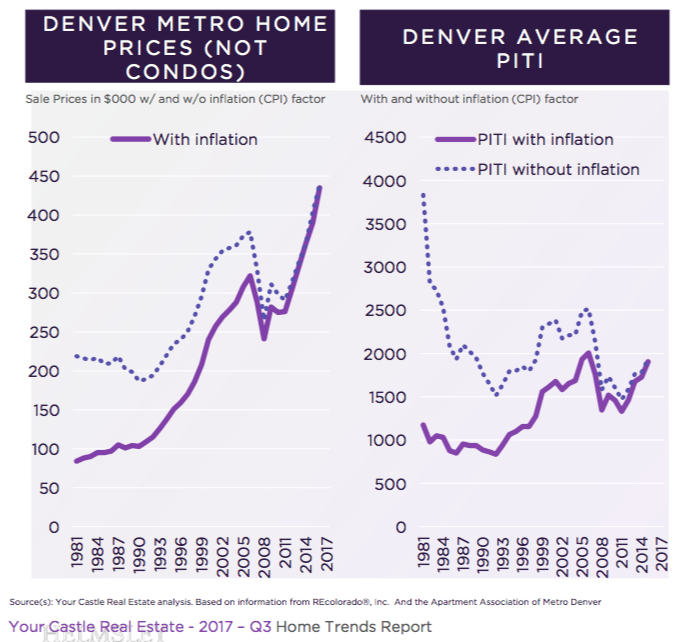 If you adjust out inflation, PITI for the average home in Denver has averaged $2050 over the past 35 years. 2015: $1935permonth,less than the historical average. Ifthemortgagerate+2%? The PITI last year would have increased from $1935 to $2405. That’s still cheaper than 2005-06. Cheaper than 1981-1989. On par with PITI in 1995! The number of transactions relative to the population of metro Denver is just about at the 35-year average. At the peak of the bubble in 2006 the number of home sales was about 20 percent above the historical average. When we see the number of closed transactions well above our historical average that’s an indication of an overheated market, as it was in 2006. The number of closed home sales is actually DOWN 1.7 percent in the past year due to the low inventory. No sign of a bubble here. In 2006, many of the deals were closed with low or no documentation mortgages (“no doc loans" or better yet "liar loans”). Because of these types of loose lending practices the Federal Reserve reported the single family residential default rate peaked at 11.4 percent in 2010. Today, mortgage underwriting standards are among the highest they’ve been in decades. In 2017 the default rate was only 4.1 percent, largely due to the tougher lending standards since the downturn. More strict lending standards prevent unqualified buyers from purchasing property, which mitigates the chance of the market overheating (fewer buyers means fewer purchases means less chance of the market frothing into bubble territory like it did in the past). 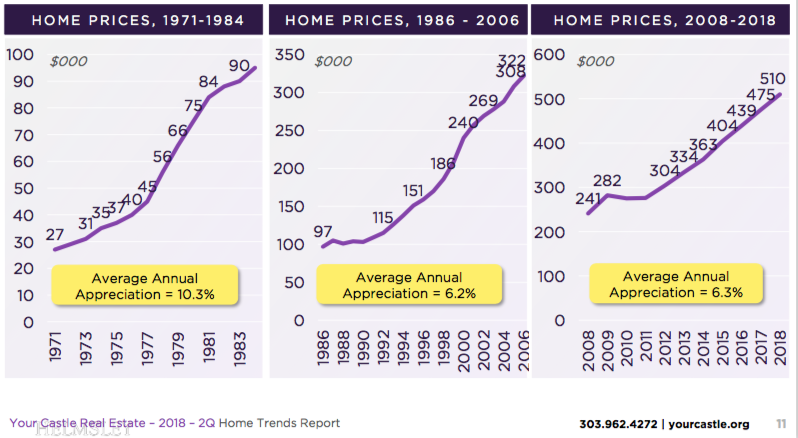 Because of relatively high home affordability (metro Denver home prices and wages have increased almost the same amount in the past 45 years and interest rates are still very low) it’s still cheaper to buy than rent in our market. This would not be true in a bubble. For housing price affordability to return to the levels that we saw in the years between 2000 and 2004, either home prices would have to increase an additional 20 percent or interest rates rise to 6.25 percent. Neither is going to happen any time soon. The imbalance between buyers and sellers we’ve seen the past few years in our housing market (too many buyers/not enough homes for sale) is due to a lack of inventory, not illogical/unrealistic/unsustainable demand from buyers. Much of the price increases we are seeing are the result of rising demand for homes for a limited supply of homes for sale. This imbalance is a logical correction from years past when we had too FEW buyers in the market and too MUCH inventory. This is how markets are supposed to work, always regressing toward the mean over time. Inventory levels of homes and condos available for purchase are historically low. 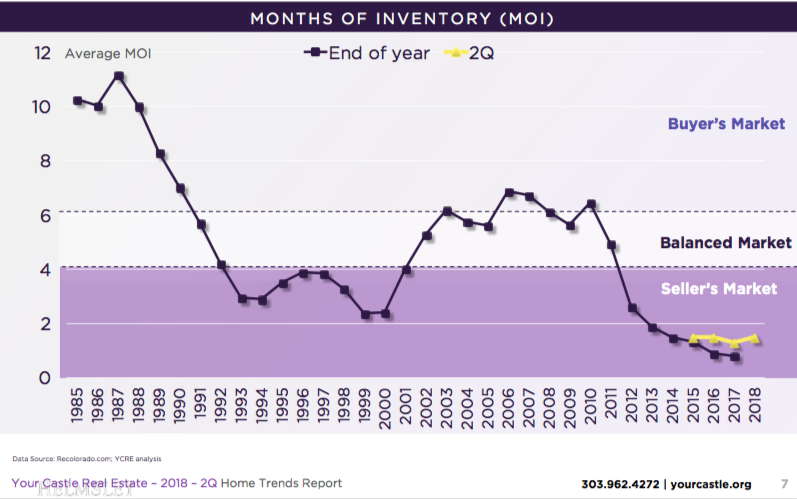 It took several years for the inventory to get this tight; it will take several years for inventory to build to historically “normal” levels. We have been through a tight inventory in the past (1993-2000). Months of Inventory (MOI) on 7/5/18 was 1.5. This statistic has been very steady during Q2 of each of the last four years. 16,000 units were permitted in 2014 and 18,000 units in 2015. That’s for rental (top bar, in yellow) and for sale (blue bar). 21,700 new units per year (14,000 for sale, 7,000 for rental) required to keep pace with 50,000 new residents per year. 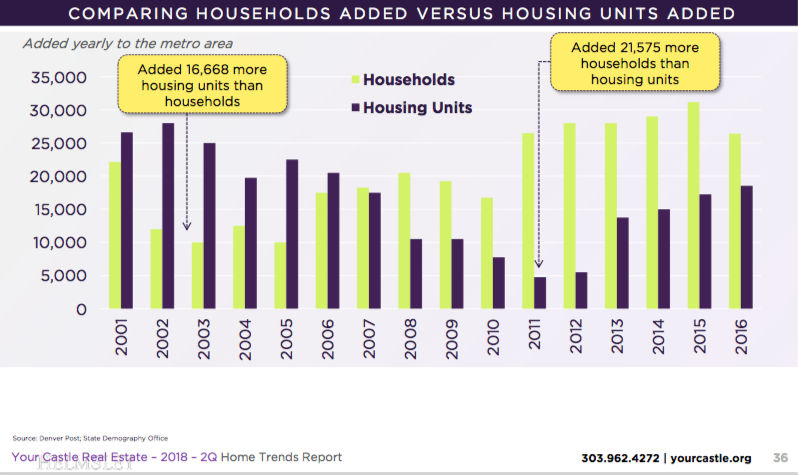 The Denver Area has been adding households at a higher rate than housing units for a decade. Historical Context: Waiting for the Market to Turn or Cool Off? The average US economic expansion (as measured by GDP growth) is around seven years long. There is a common misunderstanding that real estate also works in “seven year cycles”. This is not the case, especially in Denver. There is no pre-determined number of years that a real estate cycle is allowed to expand. The history is 14-18 years. If that is the case, we’re almost halfway into this current expansion. Buyers waiting for the market to drop to get an “opportunity” might be waiting for 5-10 years. 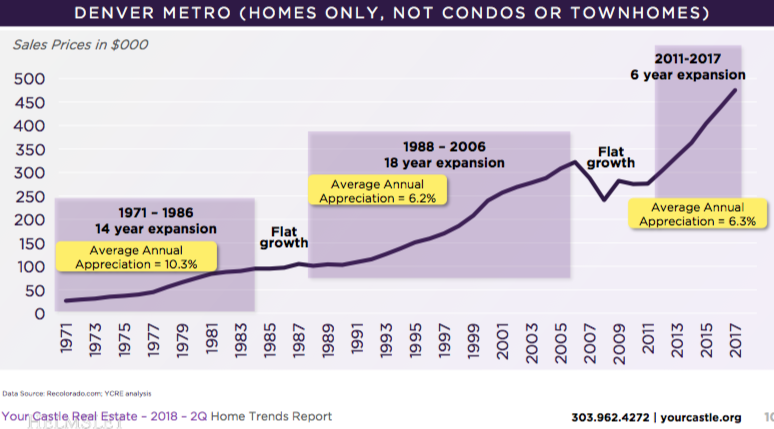 When you look at the scale on prior chart, the expansions from 1971-1984 and from 1986-2006 look much less dramatic than the most recent real estate expansion. This is an optical illusion. When you look at each expansion on its own, the scale of the chart fits the data better. You can see the actual trend much more easily. Average Denver home price from 1971-2016 was mostly an upward march: +6.3% per year. The most recent ten years of appreciation have matched the very long term appreciation curve. There’s no bubble in our market. Rising mortgage rates will help to temper the possibility of a bubble as well (they are still near 50-year lows but are expected to rise… someday). "History shows that a rapid rise in interest rates tends to have little correlation with home prices. Rather, rising rates are more likely to contribute to a decrease in home purchase volume," wrote Mark Palim in a Fannie Mae commentary. So the positive side of a rise in mortgage rates is that it will reduce the number of buyers and therefore lower the chance the market will rise out of control and end up collapsing in a bubble. Data Source: Scott Trench, Author of "Set for Life"
The inventory of metro Denver homes for sale is still near all-time lows (about 7,000 homes on the market where about 18,000 is a balanced market). 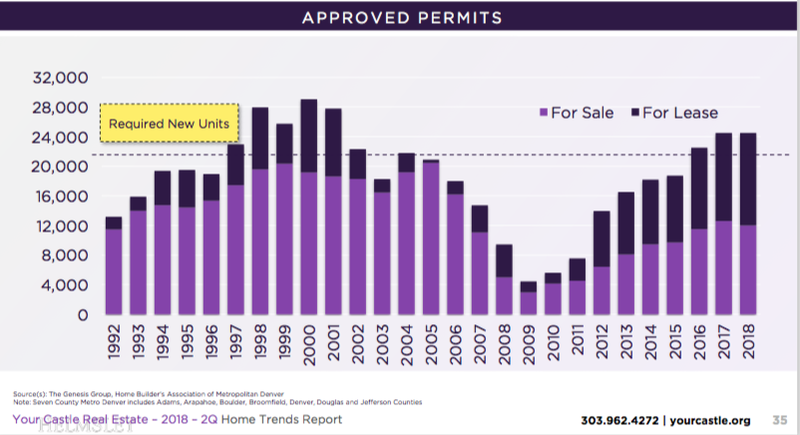 Since the inventory is still extremely limited, the demand will continue to exceed the supply for the next several years and prices will continue to rise for the foreseeable future. No bubble on the horizon yet. Stay tuned! Below is a recording with Lonnie Glessner on his "Is the Denver Housing Market in a Bubble?" class. You can also listen to the recording on our podcast channel. Low Welsh and I teach numerous Denver real estate trends classes. Please join us for a great discussion!